Augmented reality—the ability to witness an altered version of our world via a smartphone display, goofy glasses, or through a camera—is not new. Thanks to Pokémon Go, though, people might actually start to care about it. Early AR has taken many forms. It was a terrible HUD on the Pontiac Grand Prix and Aztek, for example. Pokémon Go-like use cases have been available on phones for eons. Even the military has been employing AR for over a decade—most recently built into the helmets F-35 pilots use. None of those experiences can compare to what just happened. Pokémon Go has consumed the public’s consciousness and, in a single weekend, thrown augmented reality into the mainstream. It’s fun and so people actually use it, and that’s critical because augmented reality is suddenly something the whole world can experience in an accessible and enjoyable way. The great struggle of augmented reality has really been in public acceptance. As cool as the multitude of experiences out there so far have been, most people just haven’t cared. Remember the Yelp iPhone app’s “secret” Monocle filter some seven years ago? It was cool, but ultimately not slick or useful enough for anybody to actually use it for more than just a few minutes. More recently, augmented reality has seemed on the precipice of a huge jump forward. On the advanced side of things, Google’s space-aware Project Tango phone, Microsoft’s HoloLens headset, and Magic Leap’s mysterious “mixed reality” tech each seem poised to make every nerd’s Holodeck dreams come true. On the mobile side of things more accessible to the rest of us, Snapchat filters have quickly become popular, and their neat trick has served as an introduction to what a mixed view of the real and digital world can look like for millions of people. You can go to a statue and turn it into a puppy or make it puke rainbows. It rules. Goofy Snapchat filters are such a small part of the potential of augmented reality. For that matter so is Pokémon Go. While it’s forcing the terms “augmented reality” and “AR” into the common vernacular, Pokémon Go is still just a taste of what AR is capable of—its usefulness is in the deficiencies it highlights, because Pokémon Go isn’t actually good AR. 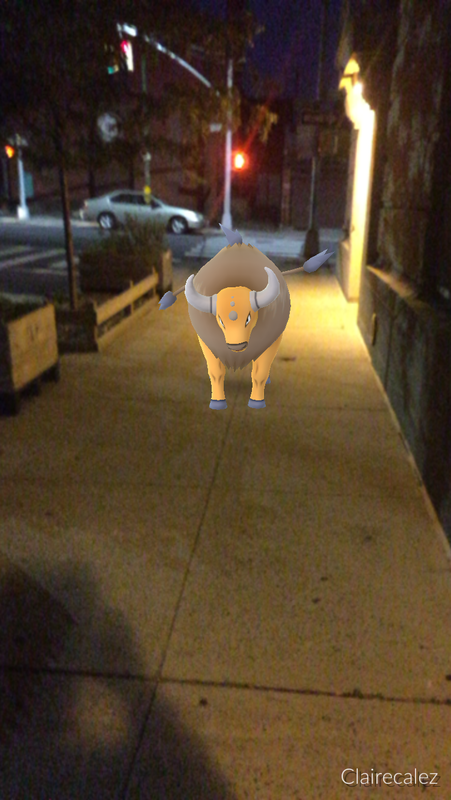 If you wonder why I keep talking about the Tauros it is because I caught one last night. Your Jigglypuff and your Tauros all appear to be the same size, even though the former is the size of a dog and the latter is, according to my super sweet pokédex, taller than a horse. And the Pokémon all sort of hover over terrain, like brightly coloured ghosts. The reason we don’t complain about these failures is because the gimmick is too adorable. Who cares if that Pikachu is chilling six feet above a fountain—it’s a goddamn Pikachu just hovering in a nebulous form of reality existing between my phone and my eyeballs! Pokémon Go has given the public a frame of reference. A benchmark with which we can now compare all other forms of augmented reality. Like HoloLens or Project Tango. In the case of the latter, Tango has spent the last couple of years struggling to explain to consumers precisely why it’s one of the coolest advances in phone tech in a while. Now, thanks to some Pokémon, I have the language to explain Tango’s awesomeness to you. Project Tango provides your phone with spatial awareness. Which means a Jigglypuff and a Tauros wouldn’t be the same damn size, and Pikachu wouldn’t simply hover in the air, stupidly and detached. You could walk around and under the enormous Tauros with a Project Tango phone, and your Pikachu would recognise obstacles, darting around the fountain rather than looming over it. That’s boss right? Better and improved interactions with your Pokémon? Hololens, Project Tango, Intel’s RealSense camera, and many other technologies are extraordinary tools of augmented reality that have struggled to explain their coolness. But some Jigglypuffs and Pickachus just gave us a way to understand the possibilities. Who could have guessed a dorky game for kids would one day be a watershed technology.